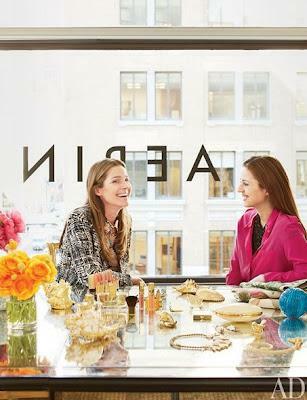 Aerin Lauder, Today's Woman Who Embodies Style! There are quite a few women who come to mind when I think of great style! Some wear the most stylish clothing, some have beautiful homes, some have stylish jobs etc. 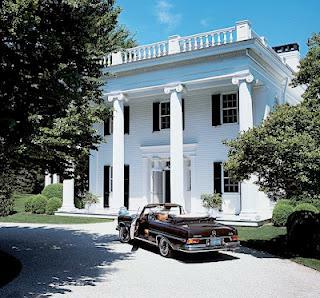 However, I think the Aerin Lauder seems to have it all.She will be launching her own line of products although she has not broken off completely from her Great Grandmothers legacy, her new company will be more than makeup and beauty products. According to the New York Times, she hopes to be the next Tory Burch. Well, she has the legacy and style to definitely accomplish that. I really like her almost effortless style, not to mention her interior style is simply stunning. Besides her apparel, she has decorated her homes with timeless pieces, inviting colors and textures. She has definitely been influenced by classic homes of the past and has taken those ideas and translated them into today’s living. 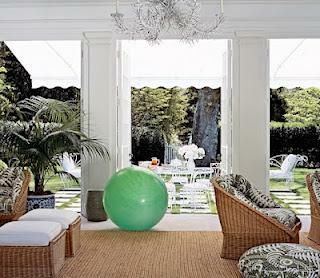 I absolutely love her East Hampton home, and find her New York apartment equally as beautiful. 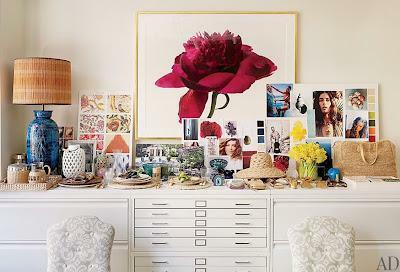 She has even managed to create a lovely and inviting office space for her new Aerin office with the help of Jacque Grange. 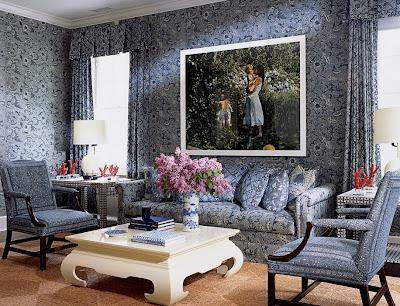 I am sure you will agree that Aerin Lauder embodies today’s great style! 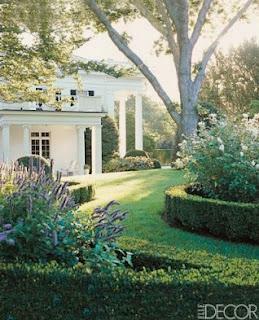 What a garden, simply stunning! 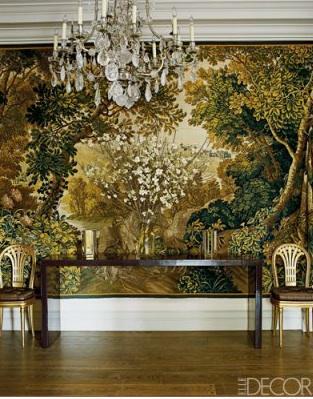 This Hampton living room could be from now or 20 years ago, its simply classic! 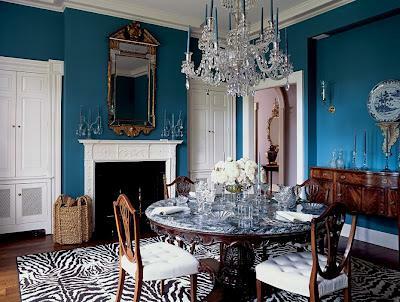 Love this bold turquoise, and formal antique dining furniture just the right mix of eclectic and timeless! 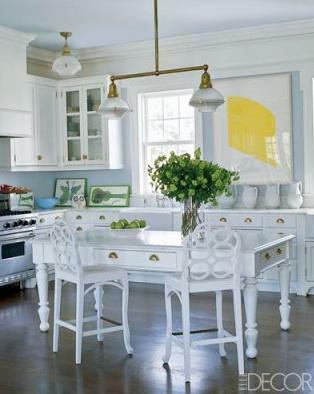 Hampton kitchen, with antique Elkins' loop chairs! 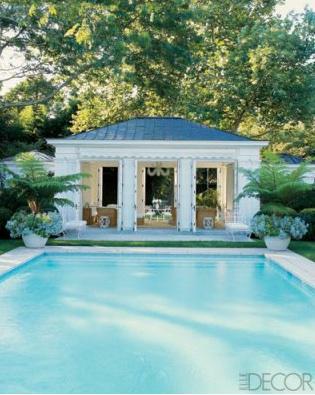 Inspired by Babe Paley's Round Hill Estate this pool house is gorgeous! Manhattan kitchen, light and airy with children's art on the wall! Aerin in her wonderful dressing room. 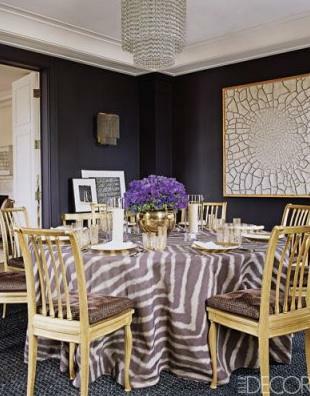 Custom Donald Kaufman paint color, with wonderful light fixture make this dining room just plain cool! 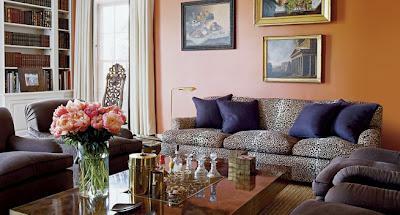 This living room is mixed very well, love the paint color with mixes of animal print, and bold eggplant pillows! Aerin in her new office design with the help of Jacques Grange. Great inspiration section with future items on great filing system.